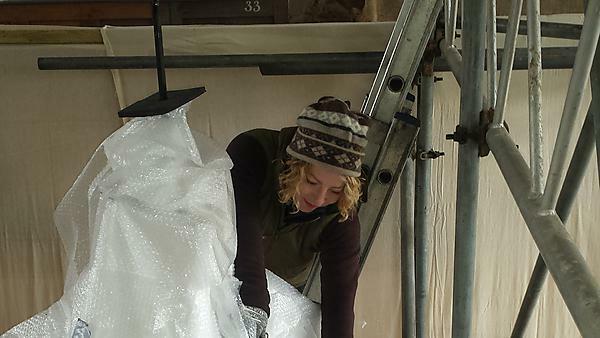 Ellin Belton now works as a Project Conservator for English Heritage after gaining her postgraduate qualification at Plymouth University. I was already working in preventive conservation during my time of study, working for both the National Trust and Chatsworth House. Thus, after graduation, I continued in this line of work. I have moved up the career ladder and now work for English Heritage. There are very few roles in my chosen field; this often requires moving, across the country or abroad, for work. Financially, there are more lucrative career paths. The best thing that I have done so far in my career has to be working with some wonderful collections, and working in some beautiful buildings. This is a difficult question to answer, but I would say that all experiences help to build who we are. Making sure that you get plenty of practice networking and volunteering alongside your studies, as this is the key to success. Having completed my studies at Plymouth means that I have gained a valuable educational qualification; this has stood me in good stead in the job market. I really enjoyed the fact that there was a good breadth of visits to historic sites; such helped bring the teaching alive. For more information about studying MA English Literature please visit our MA English Literature page. For more information about our range of courses within the School of Humanities and Performing Art, please visit the school page.